Working on Android devices is really pleasurable. The availability of plethora of apps and games make the use exciting and engaging. But sometimes new as well as advance users come across the various problems associated with Android system. 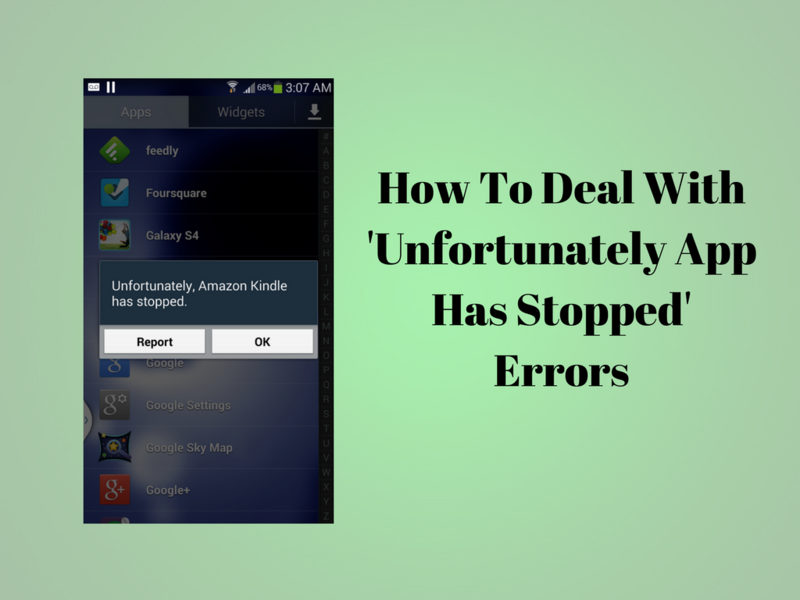 One such problem is unexpected termination of app with the error message – “Unfortunately, app name has stopped error message. This is seriously irritating especially when you’re doing something important in the middle of the app. Let’s see how you can deal with it. This problem often emerges out with the contacts, gallery and launcher apps. The procedure to rectify this is usually always the same. First, jump to the Settings on your device. Swipe left until you get the All tab. Clear cache is the option you should begin with. It will get rid of saved data that allows apps to load a little quicker when you launch them. Clearing it means the app will open a little slower, but your main problem might well be solved. Clear data will erase the entire app’s data, including files, settings and accounts, so don’t use this unless you have to. If it is not an in-built app, it is suggested to try uninstalling it and then reinstalling it from the Google Play Store. Just open the Play Store app, open the menu bar on the left hand side and tap on My apps. Find the app in question and tap Uninstall, which takes a few seconds. Later, you can install it again. One easy to deal with it is by doing a soft reset, which means restarting your device. This is extremely easy and really effective if your phone has been on for a long time. A soft reset will power cycle your phone, turning it off and then back on again. After trying above solution, if the problem is still there, the last option is to reset your device. When performing a factory reset, make sure to take back up of the entire data data beforehand. This is really important. A factory reset will wipe your device and set it back to factory state, eliminating everything, including any bugs, with it. You can restore your apps and data later easily, as long as you’ve had a backup. Is the above given solutions worked for you? Do you know any other ways to deal with this problem? If yes, share with us by commenting below.